Eatability – No, not exactly the same as that campaign for the pale fizzy stuff The Man tried to sell you by convincing you his product was in fact, drinkable. One of the things that make kolaches great is that you can eat them on the go. This category will measure the neatness of the kolache while it is eaten. A score of 0-3 will be assigned. Taste – Each kolache will be scored based on overall flavor… pretty straightforward. 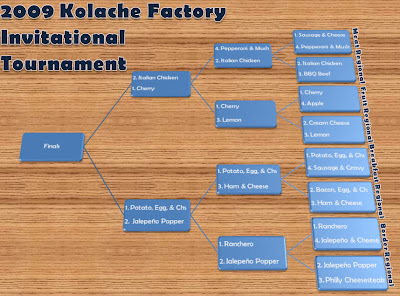 For each matchup, the highest scoring kolache will move on the KFIT Semifinals. Welcome to the Regional Finals! Which kolache will reign supreme? As in Round 1, the matchups will be recapped below as they are completed, with the newest appearing at the top. Check back often or follow The Ferm's twitter feed for updates. Click below to enlarge the current bracket. Before we get started, I'd like to give some shout outs. Thanks to Mr. Smokeypants' brother-in-law for the Eatability category suggestion. Thanks to J. R. Ewing for unknowingly inspiring the Value judging category with his under appreciated Minute Maid Shenanigans posts on the inexplicable value discrepancies in beer prices throughout the ball park. Huge props to Marco at the 10455 Briar Forest store, who politely took my big list of kolaches last Friday and filled it without a question or cross look... despite it being 6:15 in the morning. And finally, thanks to the Kolache Factory Twitter dude, who is aware of this project and hasn't shut it down yet. Italian Chicken edged BBQ Beef in the equivalent of a double OT win. But Italian Chicken’s win pales in comparison to Pepperoni & Mushroom’s shocking defeat of #1 overall seed Sausage & Cheese. Italian Chicken has enough cheese to hold the chicken together. Pepperoni & Mushroom, seemingly still riding the high from its improbable defeat of Sausage & Cheese, showed up for this matchup with almost no filling. On the positive side, the lack of filling increased its score for Eatability. However, a single spill from the Pepperoni & Mushroom would mean grease stain city, my friends. In what could only be described as coming out flat after the emotional high of a tough victory, both kolaches under-performed in this matchup. In my opinion, the Italian Chicken and the Pepperoni & Mushroom that showed up today would have lost in the 1st round in this form. But in a single elimination tournament, only the current game matters. Italian Chicken was still relatively strong and only a little drier than previously. 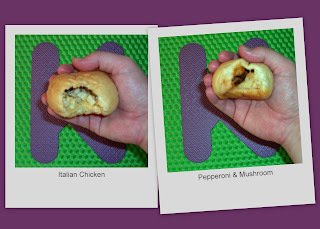 Pepperoni & Mushroom left the judges wondering where the pizza was today (see Round 1 photo). Its #1 seeding in the Fruit Regional was controversial, but Cherry backed up the pre-tourney grade with a win over the formidable Apple. Lemon advanced by out goo-ing the competition in somewhat of an apathetic battle with Cream Cheese. Each kolache was easy to hold, but the bite that breaks the goo-containment wall was the most telling. Cherry’s goo was a little less viscous than that of Lemon’s (Judge's note: goo viscosity assessed after 30 seconds in microwave). Cherry brought its A-game for the Fruit Regional Finals. It was tart and packed with cherries, unlike the 3 ½ fruit pieces for the Apple matchup. Lemon was good, but it was surprisingly less tart than Cherry… something the judges weren’t too sweet on. The bonus points are gimmes in this matchup. All the fruit kolaches are the same price. P-E-C cruised to the Regional Finals by outmatching Sausage & Gravy, which is like the Morehead State of Kolaches. Not that there is anything wrong with Kentucky universities, but P-E-C is no mid-major. 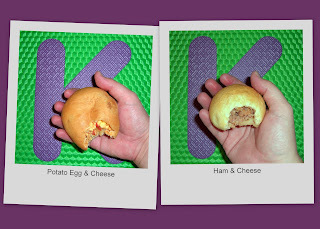 Ham & Cheese pulled off somewhat of an upset by defeating an egg kolache in the Breakfast Regional... and one with bacon! 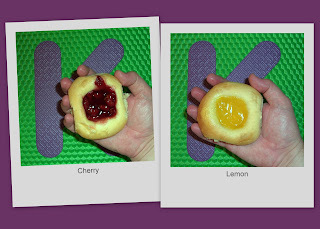 The tasting notes on these kolaches are similar to that of the 1st round. I’m not sure why P-E-C has peppers and tomatoes in it, but I like it. This is a tasty kolache that is somewhat “border” inspired. As for H&C, the use of a white cheese (Swiss?) is not what I would expect, but it tastes good. I only wish there was a little more cheesiness in the H&C. P-E-C get the Meal-in-One pricing, while H&C is kind of a bargain priced meat kolache. Crap! I did not have a backup plan for a tie, so in the spirit of competition, I chose the most powerful resolution criteria ever invented. 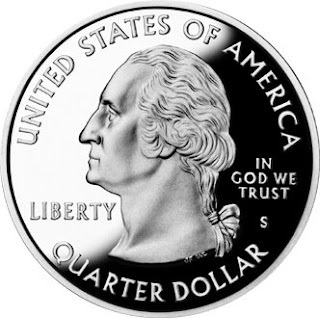 Nope... not Rock/Paper/Scissors... a coin toss. P-E-C takes its place on the stand. Ranchero ran through the first round by taming the not-for-the-sensitive-stomached Jalapeño & Cheese. July’s Kolache of the Month, Jalapeño Popper, frazzled the frizzled steak of Philly Cheese Steak to start its magical run to the championship. 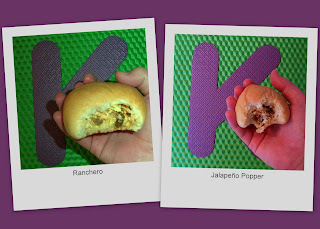 Egg kolaches have an inherent disadvantage in the eatability category, and the Ranchero is no different. The scrambled eggs don’t seem to be cooked with the other ingredients, so everything tends to want to follow the Newton’s laws of gravity. Inside the Popper, the bacon and jalapeños use teammate cream cheese to bond. The Ranchero is like a Mexican breakfast in your mouth… but with like, ham. The Jalapeño Popper is like heaven in your mouth. Bacon and cream cheese just go together like the sun and the sea or like bees and honey. Mix in some jalapeño and it’s like rama lama lama ke ding a de dinga a dong. I’m not sure what the addition of bacon would do to Ranchero, but in its current form, the ham just doesn’t do it for the judges. The Popper is a “Kolache of the Month,” so I don’t know if that status comes with special pricing, but the rules are the rules. JR likes the taste points per dollar.